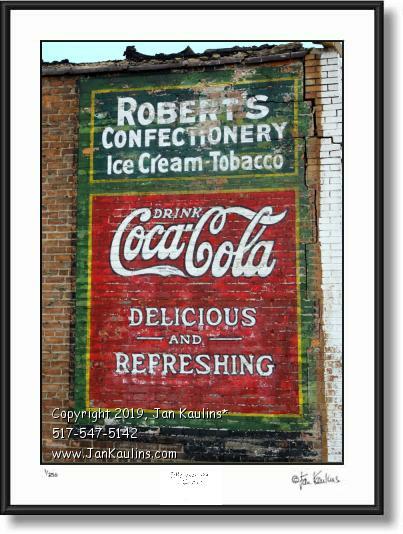 COCA COLA GHOST SIGN MURAL DETROIT photo picture wall art print for sale. This vintage COCA COLA ADVERTISING SIGN picture print for sale was painted on the side of a brick building near Mid-Town Detroit. A building was soon after built immediately adjacent to the painted advertising mural where it was covered up for many years. This past Fall the dilapidated adjacent building was torn down once again revealing this long covered up advertising sign. This old Coca Cola advertising sign is just one of the Detroit Ghost Signs found in my Detroit Photo Gallery. The copyright info etc. shown on this web image do NOT appear on the photo that you purchase.